Voice Reports gives users of Ask Alexa a number of options of how to report on areas of the household. This could include status of lights, devices with batteries, or even the status of water sensors around your house. Coupled with advanced voice filters, you have a powerful mechanism to actively report on the areas of your home, querying and responding in a very conversational manner. 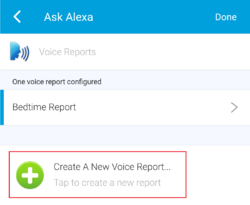 To create a new voice report, find the green button labeled <<Create A New Voice Report...>> within the <<Ask Alexa Extensions>><<Voice Reports>> area. 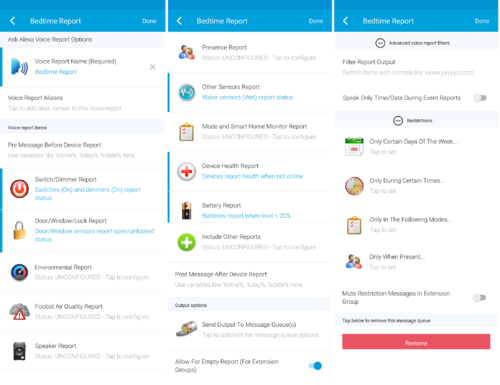 There are multiple types of voice reports to choose from and they can be combined into one large report if you wish. Many of the reports allow you to consolidate the devices' status into one statement. For example, if you have a large number of switches you are monitoring but are only concerned about the ones that are on you can specify just to give that information, or if they are all off, it will state that without listing each one. In addition, some devices like motion or presence sensors allow you to create a report of the last time the device was active. This is great for remote monitoring of a location to ensure there is activity (Maybe an aging parent or family member). Door/Window/Lock Report This report will allow you to get a consolidated report of the open windows, unlocked doors, or open sensors. You can also get the status of window shade and set options for speaking the last time a window or door was opened, or when the last time a lock was unlocked. Please note that by default the report will only devices that are open or unlocked. To have a report on the status of every device (not advisable...it can be lengthy) you should run a summary report. Environmental Report As the name implies, this will report out specific enviromental readings from your SmartThings devices. For example, you can read the temperature and humidity devices in the house (or have the option of giving you just the average of the readings of two or more devices). It will also allow you to check the setpoints of various thermostats (and options to get current attributes like temperature, humidity and device state/mode). In addition, you can get the UV reading from an outdoor weather device. Foobot Air Quality Report This report should ONLY be used with the Foobot Air Quality Monitor device (Information here : Foobot_Air_Quality_Monitor). This report will give you the air quality from the device, along with options to give other pollution and environmental readings. Speaker Report Just like the other reports, you can have Ask Alexa include a speaker report with the other reports within this macro. Please note that there is a refresh time if you manually turn on the speaker before SmartThings registers it. This could be up to 5 minutes, in which case, the report may be inaccurate. When it does refresh, the speaker will tell you what it is playing and the volume level. Other Sensors Report This is an area for other sensors you may have within your SmartThings account. Currently, acceleration, water, motion sensors, room occupancy and power meters are supported. For motion sensors, you can also get a report of the last time a motion sensor registered movement. Device Health Report This will report the device status according to SmartThings. 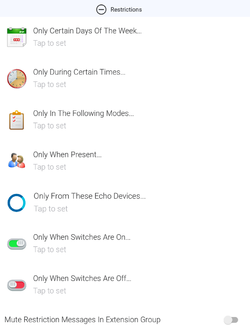 There are options to give a summary (if all are online) or simply report ONLY offline devices. Please note that devices may be marked as "offline" for a variety of reasons; this report will simply allow you to report on them and investigate. Battery Report This report will allow you to call out when a device (with a battery) is below a certain threshold. Include Other Reports This area will allow you to include weather, other voice reports or even message queue contents in the output of the current report. In addition to these reports, you also have the option of entering customized text that will be spoken before and after the main report. In the example above, this report was created to be played back at night, ensuring all doors and windows were closed and locked, wishing the user a good night's sleep. In this free text area you can add certain variables to give day, date and time the report is spoken. Examples of these variables are outlined in the Ask_Alexa#Global_Variables section. Finally, at the bottom of the voice reporting page that will allow you do a couple things to filter the voice report. First, you will have the option to filter out words or phrases from your voice report. For example, let's say you prefix all of your switches with a text code for multiple locations (Like "BB"). While this is great for visual organization, you don't want to constantly hear "BB". Another example would be to remove all but a piece of the voice report. Let's say you can the voice report output of the last event. You could remove all of the standard text except the time stamp. To do this, simply put the text your want filtered, separated by commas. In these examples, you filter would look like this: BB, The last event. "BB" will be removed as well as any instance of "The last event". Also part of the filtering options is the ability to only speak the time and date if you choose to speak an event status. Consider this use case: A user has a motion sensor on a dog door. In your pre-message you would put "The last time Fido was outside was " and then choose the motion sensor (making sure you configure it to only read when active and to give the last motion event). Naming the report something like "When was Fido outside last", you could then say <"Alexa, ask SmartThings when was Fido outside last">. If you set up the macro correctly, you will get a response appearing to answer your question. Just like macros, you have the option to restrict when the voice report activates. These include restrictions based on the day of the week, time of day, which mode you are in, whose presence sensors are 'present', which Alexa you are commanding or which switches are on or off. These restrictions, by themselves, may not be very useful on their own; however, when used with extension groups, the responses can be more 'dynamic', possibly playing different reports based on the the day of the week. Please remember ANY changes or additions you make to your Ask Alexa environment should immediately be followed up with running <<Settings>> <<Setup Variables>> in the main Ask Alexa SmartApp. 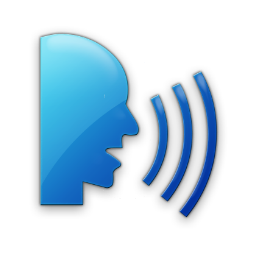 This will allow newly created voice reports to be reflected in the Amazon developer site. See Ask_Alexa#Setup_Variables for more information. This page was last edited on 18 March 2018, at 20:11.